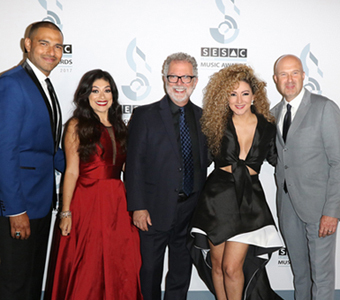 Over the past decade, performing rights organization SESAC has continued to rise as an innovative and technologically adept PRO that is representing a greater number of top songwriters & artists. 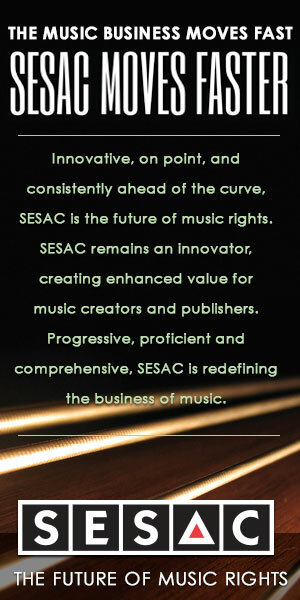 Combining the personal service of a smaller PRO with the state-of-the-art ability to pay royalties on a monthly basis rather than a quarterly basis, SESAC has become a leading option for many songwriters and music publishers. Originally established in 1930, SESAC now licenses the public performances of more than 400,000 songs on behalf of its 30,000 affiliated songwriters, composers and music publishers. SESAC represents the song catalogs of such prominent songwriters & artists as Bob Dylan, Neil Diamond, Adele, Mariah Carey, Green Day, Hillary Scott (of Lady Antebellum), Randy Newman, RUSH, Zac Brown Band, Mumford & Sons, Kings of Leon, Nikki Sixx (of Motley Crue), the Avett Brothers, Robin Thicke, Kesha, Erika Ender, James Napier, Charli XCX, Shawn Stockman (of Boyz II Men) and many others. Certainly, SESAC’s Creative Services has played a vital role in signing and providing service for top songwriters, as well as signing and assisting talented new writers. 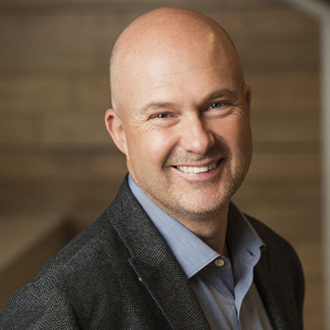 Since 2014, the PRO’s creative division has been led by Sam Kling, who is Senior Vice President of Creative Operations. He oversees the company’s growth strategies for artists affiliations, music publishers and new business opportunities within the creative community. Kling manages the Creative Services team in London, New York, Nashville and Los Angeles, where he resides. Since joining SESAC in 2014, Kling has installed an innovative client services structure as well as elevated the company’s affiliate roster by collaborating with some of the industry’s most significant artists, music publishers and managers. He has led the department’s strategic effort to secure songwriters and composer affiliations with many top artists & bands. Kling also spearheaded the partnership signing of publishing company Universal Publishing Production Music. Prior to SESAC, Kling served as Vice President at peermusic, where he oversaw the company’s U.S. Pop A&R as well as its Film & Television creative operations. Prior to working at peermusic, Kling served as Vice President of Film & Television for BMG Music Publishing, where he managed their U.S. synchronization operations. In addition to his work at SESAC, Kling is a T.J. Martell Los Angeles board member, a voting member of The Recording Academy, and a board member of the Association of Independent Music Publishers (AIMP). Kling holds a bachelor’s degree from the New School University in New York and an MBA from the UCLA Anderson School of Management. We are pleased to do this new Q&A interview with Sam Kling. He tells how he got started in the music business, and he discusses SESAC’s creative operations. He also explains how SESAC works as a unique PRO that can assist both major songwriters and talented newcomers. DK: How did you get started in the music business? 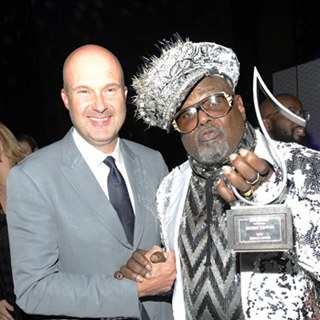 Sam Kling and funk/R&B legend George Clinton at the 2017 SESAC Pop Awards in New York City. Sam Kling: First of all, I’m from New York City, and I used to be in the restaurant and nightclub business. I happened to have a musically talented brother, Adam. He wrote a song that I loved, and it just sounded like everything we were hearing in the club where I worked. And the club happened to be owned by a consortium of people, but with two main partners, one who was a music industry attorney and restaurant & nightclub impresario. There were a lot of music executives that would come to the club, and I eventually convinced one of the execs to let me come up to his office and play him my brother’s demo. I got to his office which was in the famed 1650 Broadway building. It was covered in gold and platinum record awards and I handed him a cassette. He put it in his tape machine and pressed play. Then about halfway through the song he stopped it, and he turned to me and he said, “You know, I thought this would be a 30-second long meeting where you bring me some really bad music. But you brought me a hit record and I’m gonna buy it from you, and your brother’s gonna produce it.” That meeting was with the founder of Next Plateau Records, Eddie O’Loughlin, and that was my entry into the music industry. So we started a production company and a management company, and within several years, we had been doing work for the band Bush, for Britney Spears, Meredith Brooks and a lot of top artists of the ‘90s. And that included a stint for me managing a very popular, Canadian reggae singer named Snow for several years. I ran the management & production company until 2004, when, ultimately, we decided that my brother would go off and do production on his own, and I went to work for BMG Music Publishing, and eventually I ran their Film & TV department. DK: You were a Vice President of Film & Television Music at BMG for three years. How did you decide to work at peermusic in 2007? Kling: 2007 was an interesting and busy time for me, because BMG was being sold to Universal Music Publishing, and the [merger transition] happened in late summer that year. And at that time, I was also entering business school and my wife and I were expecting twins. My job status was uncertain based on the staffing at Universal. I started classes at UCLA (Anderson School of Management), and then two months later our twins were born. And a month after that, I was fortunate that a great opportunity opened up at peermusic. It’s an exceptional company run by very knowledgeable people. DK: When you were at peermusic, did you do A&R and sign writers? Kling: Yes. I signed several writers, including Tyrese Gibson, and a band called Family of the Year which had a hit called “Hero.” I worked extensively with (hit songwriter) Ester Dean—she’s probably a highlight of my career from a songwriting perspective. The sequence of number one hits that we had with her was incredible. I also got to work with (hit writer/producer) Tricky Stewart, his brother Laney Stewart, and other exceptional songwriters that we had there, including Traci Hale (who happens to be a SESAC songwriter). DK: After working as an exec at BMG and peermusic, what made you decide to join SESAC in 2014? Kling: Since the early ‘90s, I’ve spent my working life advocating for songwriters, for creators. There is an incredible appetite for the consumption of music. There’s more music being consumed than ever before. Unfortunately, not only songwriter royalties are being diminished, but also publisher royalties are also suffering. And in conversations that I was having with the team at SESAC, I realized that there was a way to try to address and fix that. SESAC could be part of the solution to return value to songwriters and publishers. And SESAC is uniquely situated to do that. So, it was that element of, “Hey, we can provide real solutions, we can help drive rates up for our writers in the marketplace.” And that was very attractive to me, to be able to help songwriters. I believe songwriters are key element to the cultural fabric of our lives. So to be able to return better value to them, is something very near and dear to my heart. And at SESAC, I could be involved with it on a much higher level than I could as a manager or publisher. DK: During the past few years, SESAC has made some big signings like Green Day, Adele and other stars. Were you involved in helping to sign those writers to SESAC? Kling: Yes. The Green Day conversation started between us and the band’s business manager, Bill V, and other Green Day representatives. 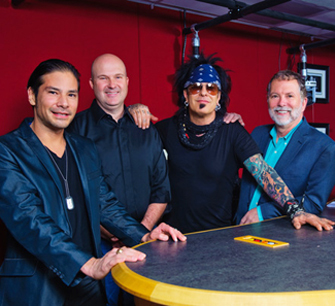 And when the band became interested in SESAC, I went down to their office in San Diego and helped convince them that SESAC would be a great place for them to be. And from there, it all came together. I have also signed Robin Thicke, Rosanne Cash, Shawn Stockman from Boyz II Men, Kings of Leon, and Kesha. DK: In your bio, I read that you’ve helped install an innovative, client services structure at SESAC. Can you please tell me about this? Kling: Sure. There’s a wide range of affiliates that SESAC has, and that can be from songwriters who are just getting started, to superstars, and we have every level in-between. We have songwriters like Jimmy Napes and Charli XCX who are incredibly popular and big songwriters right now. We also have Erika Ender who co-wrote the worldwide smash, “Despacito.” So the level of service that each of those writers need has to be highly tailored. And there’s a big distinction between SESAC and our competition. That is, we’re much smaller, so we have the ability to have a close relationship with our songwriters that other PROs cannot sustain. Therefore, if we have, say 30,000 songwriters, and I have, say 20 to 25 people on my team whose job it is to be in touch with those songwriters, we can literally have a one-on-one relationship with songwriters who want to have that relationship. We can also know their managers, their lawyers and their business managers. And by doing that, we can have a positive impact on their careers, to the extent that they want it. For instance, Shawn Stockman of Boyz II Men wanted us to set up Nashville-based co-writing sessions for him. He wanted to branch out to areas of music where he currently hasn’t, so we’ve been able to facilitate sessions for him. We also book stages and showcase bands at South By Southwest and two festivals here in L.A. For instance, Kaleo is a band on Atlantic Records that’s had success over the past two years. We were able to put them on a stage and reach a new audience to which they didn’t necessarily have access before. We try to really fine-tune our stages and match the artist and songwriter to the audience. DK: Since you’re the head of creative at SESAC, can you talk about some of the other creative execs who are part of your team? Kling: First of all, I would love to acknowledge the entire Nashville team, which is led by Shannan Hatch (Vice President of Creative Services). She’s one of the most dynamic executives I’ve ever known in this business. She lives, eats, and breathes music. Her husband Rob is a very accomplished, hit songwriter. The friends that they have over to their house, are some of Nashville’s most well-known songwriters and artists. In our New York office, we have Jamie Dominguez (Senior Director of Writer/Publisher Relations), and her knowledge, particularly of the New York indie-rock scene, is incredible. She’s been with SESAC for a long time. It’s been a thrill to be able to see somebody who’s become such a mainstay in that world and thrive. Here in Los Angeles, we have people like James Leach, Mario Prins and Glen Phillips. Mario’s very in tune with the pop, urban and EDM worlds, as is Glen with the rock world. Mario’s a DJ and Glen was a touring manager for a long time and was responsible for bringing Rock & Roll Hall of Famer Rick Nielsen and Nikki Sixx to SESAC. The entire team is made up of people who are just truly engaged with what’s going on. And we have a lot of other great people—there’s John Sweeney in London who’s probably SESAC’s best kept secret. He’s overseeing some of our most powerful affiliations, particularly with songwriters coming out of the U.K., such as Jimmy Napes and Charli XCX. DK: Thank you Sam for doing this interview. Currently, what are SESAC’s goals, and what makes SESAC a better option for songwriters than the other PROs? Kling: Those are great questions. I think on the creative front, we are very much focused on bringing songwriters into the fold with whom we can have mutually beneficial relationships. At other PROs, if you’re a songwriter, you can go on their website and sign up, no questions asked. You can just join. Whereas at SESAC, we want to hear your music, we want to know who your manager is, and what kind of relationships you have in the marketplace. In this world, as I’m sure you’ve come to know, nobody is going to work harder for you than you. So if you’re a songwriter and you think, “Hey I’m going to join a PRO and those people are going to get me sessions, they’re going to put me in networking opportunities, and make me a hit songwriter,” that’s not a realistic approach. But if a songwriter looks at a PRO, almost as if they look at their instrument, and they think to themselves, “Hey, this is a pretty powerful thing here (at SESAC), and I’m going to put the time in, and I’m going to learn how I can interact with [the team at SESAC] and how together, we can make progress on my goals as a songwriter,” then that’s the kind of new songwriter for which we’re looking. This means, I want us to have songwriters who are focused on refining their art, and making sure that what they’re putting out into the marketplace is the absolute best it can be. And when they’re doing that, we have very powerful relationships that we can open up and help them progress through their careers. I like to think of SESAC as being a fourth or fifth team member for a powerful songwriter. It can be a relatively new songwriter like Sam Fischer who’s signed to Columbia, or it can be an established hit writer like Erika Ender. Whatever they need, we can provide it. And because they are doing the absolute best work, and they’ve put together strong teams, we can augment that team. And that’s the kind of approach that I want SESAC to have. If you’re a hard-working songwriter, then you’re going to be very happy here, because first, you’re going to know people’s names, phone numbers and email addresses (at SESAC), and you’ll get responses from us. Second, if you have questions about your statement, or about your song registrations, or about networking opportunities and songwriting opportunities, we will help. I believe very strongly that now is an amazing time to be a songwriter, a music creator. I think that based on the outlets that exists out there for music, it’s a critical time and organizations like SESAC are fighting very hard for songwriters and music publishers to be able to make a living. I know that publishers’ and writers’ interests aren’t always aligned, but the fundamental principle of granting access to great works to any of the exploitation channels that exist, be it digital, analog, or film & television, is at the core of SESAC’s thoughts day in and day out.